Port Blair, Sept. 15: The two day national level workshop on values of Biodiveristy in Island Biosphere Reserve concluded at Port Blair on Saturday evening. The workshop was jointly organised by the Zoological Survey of India (ZSI) and National Biodiversity Authority (NBA) exclusively for the students, research scholars and teachers at the ZSI Regional Centre at Port Blair. Delivering Valedictory address, the Principal Chief Conservator of Forests, Madhav Trivedi informed that the islands administration took necessary steps for the conservation of the rich biodiversity in the islands even before the enactment of Biodiversity Act in the country. He said India signed the International Biodiversity Convention in the year 1992 followed by significant treaties on global biodiversity conservation. However, these conventions and treaties are obligatory in nature and not legally bound. Hence, the government brought the legislation for the effective implementation of the provisions of these conventions and treaties across the country. But, in Andaman and Nicobar a steering committee has been formed even before the advent of this act and significant initiatives were taken to preserve the fragile ecosystem of these islands. Complimenting the efforts taken by the ZSI for organising the workshop for the students community, he said the role of students is more important in the biodiversity conservation and sustainable development and hence learning about biodiversity through such workshops will be of immense helpful to them to do their role. He further informed that though the natural calamities such as Tsunami and earthquakes are inevitable, the effects of the disasters can be minimized through proper planning and management at all levels. He emphasised that the students should be imparted necessary knowledge to meet out any eventuality so as to mitigate the effects of the disasters. 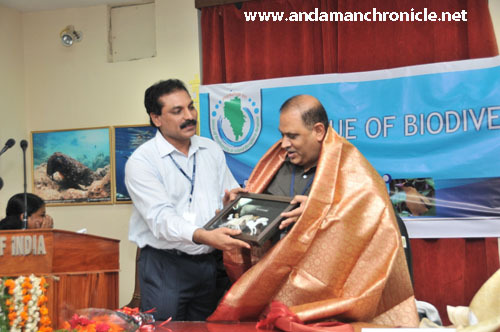 Speaking on the occasion, the Director of ZSI, Dr K Venkatraman informed that there 92,000 animal and 46,000 plant species are found in the world, of which 8 per cent are reported from the Andaman and Nicobar region. He added that the islands are rich in marine species accounting for more than 70,000 species out of 2 lakh species found worldwide. Dr Veronica Albuja from Natural Sciences Division of UNESO stressed on the importance of maintaining proper balance between man and biosphere and called upon everyone to contribute their mite for the best of the future generations. During the workshop, the eminent speakers delivered 19 lectures on wide ranging issues pertaining to Biodiversity. During the sessions held on Saturday, Dr C Ragunathan, Officer in charge, ZSI, Dr Murugan, Officer In charge, Botanical Survey of India, Dr Justin, Superintending Anthropologist, Dr N Ramanujam, Professor of Disaster Management, Pondicherry University, Dr Dinesh Kannan, Divisional Forest Officer, B P Yadav, Divisional Forest Officer and Dr C Sivaperuman, Scientist, ZSI gave their lectures supported by power point presentations. Dr PM Mohan, Professor of Ocean Studies and Marine Biology summed up the proceedings of the workshop. The Chief Guest, Madhav Trivedi honoured all the speakers with mementos and certificates. The students and teachers attending the workshop were also given the certificates and mementos.